Sweyn was was king of Denmark during 986–1014. He ruled as King of England for 41 days in 1013/1014. The "Chronicle of John of Wallingford" (c. 1225–1250) records Sweyn's involvement in raids against England during 1002–1005, 1006–1007, and 1009–1012 to avenge the St. Brice's Day massacre of England's Danish inhabitants in November 1002. According to Ashley (1998), Sweyn's invasion was partly motivated by the massacre of Danes in England ordered by Aethelred the Unready in 1002, in which his sister and brother-in-law are said to have been killed. In 1013, King Æthelred fled into exile with his two sons. 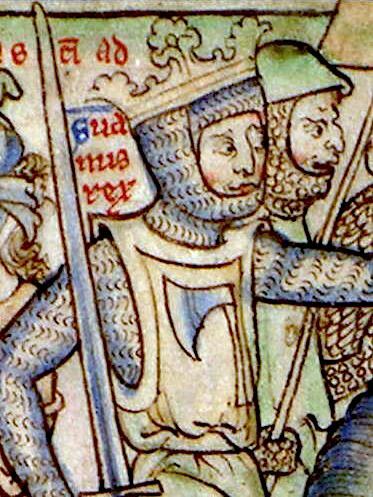 On Christmas Day 1013 Sweyn was declared King of England. He died 5 weeks later. He was the father of King Harald II of Denmark, King Cnut the Great and Queen Estrid Svendsdatter.